Dr. Kocher is a Resident, Department of Radiology, Walter Reed Army Medical Center, Washington, DC; Dr. Smirniotopoulos is Program Leader, Diagnostics and Imaging Center for Neuroscience and Regenerative Medicine (CNRM), Professor of Radiology, Neurology and Biomedical Informatics, and Chair of the Department of Radiology and Radiological Sciences, Uniformed Services University, Bethesda, MD; Washington, DC; and Dr. Smith is Chief, Neuroradiology, Department of Radiologic Pathology, Armed Forces Institute of Pathology Washington, DC and Assistant Professor of Radiology and Radiological Sciences Uniformed Services, University of the Health Sciences, Bethesda, MD. Spinal lesions are usually classified into 2 broad categories: extradural and intradural. Extradural lesions are located outside of the surrounding dural sac; they are often related to lesions of the intervertebral disc or the spinal column. Intradural lesions occur within the dural sac and are further classified as either intradural intramedullary or intradural extramedullary lesions. Intramedullary intradural lesions are within the substance of the cord. Extramedullary lesions are located within the dural sac but exterior to the spinal cord. This article will focus on the characteristic magnetic resonance imaging (MRI) findings of the most common intradural lesions and their differentiating imaging characteristics. Intramedullary lesions are recognized either because they alter the signal intensity or attenuation of the spinal cord; or, because they change the shape and size of the cord. The most common intramedullary lesions may be neoplastic, inflammatory, vascular or congenital. Primary tumors are usually glialastrocytoma in children and ependymoma in adults. Both neoplasms expand the cord. In the absence of cord expansion, another diagnosis, such as a demyelinating process, should be considered. Ependymomas are typically confined to ≤5 vertebral segments.6 Associated intramedullary cysts have been documented in 50% of cases,7,8 and can be rostral or caudal to the neoplasm, intratumoral, or result from reactive dilatation of the central canal. Hemorrhage is also common, occurring in 19% of patients in Kahan’s study.4 Ependymomas tend to compress the adjacent spinal cord rather than infiltrate it, making them amenable to microsurgical resection. 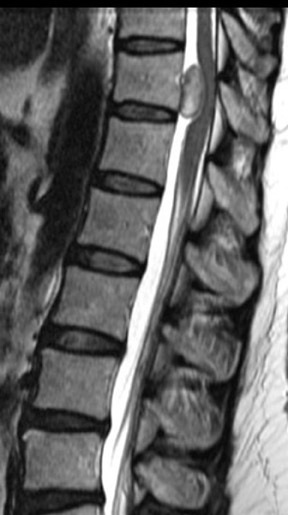 Unlike intracranial ependymomas, calcification is not common in spinal ependymomas. Kahan et al. described the imaging characteristics of ependymomas as isointense to hypointense on plain T1-weighted (T1W) images, and hyperintense on T2-weighted (T2W) images. Classically, ependymomas have shown intense, homogeneous and sharply demarcated focal enhancement.1,2,9–11 However Kahan’s study of 26 cases demonstrated only 38% of tumors with this pattern; 31% showed heterogeneous enhancement (Figure 1); and, 19% showed ring enhancement. Because of their tendency to bleed, a hypointense “hemosiderin cap” is seen on T2W images in roughly one third of cases (Figure 2). Myxopapillary ependymoma (MPE) is a subtype of ependymoma that is predominantly found in the region of the conus medullaris and filum terminale, and represents 27% of all intraspinal ependymomas.12 MPE is also the most common neoplasm of the conus medullaris. The mean age for presentation of this tumor is in the fourth decade. Tumors, if small, tend to displace the nerve roots of the cauda equina; whereas large tumors often compress or encase them.4 These lesions are often described as sausage shaped, well-demarcated and/or encapsulated. They can be tethered both proximally and distally.4 Multiple lesions may be present in ≤40% of cases, which may be the result of the subarachnoid dissemination.13 The MPE subtype is prone to hemorrhage, and can present with subarachnoid hemorrhage. Over time this may result in superficial siderosis caused by the deposition of iron pigments on pial and arachnoid surfaces.12 Imaging of superficial siderosis reveals a thin hypointense line conforming to the surface of the spinal cord, best seen on heavily T2-weighted images. Kahan et al. found that a significant number of myxopapillary ependymomas have high signal on T1W images, unlike typical cellular ependymomas seen in the cervical and thoracic cord. They postulate that this is the result of myxoid material within the connective tissue elements. The increased T2 signal and enhancement characteristics are similar to other ependymomas (Figure 3). Astrocytomas are typically located eccentrically within the cord, and may rarely be exophytic. They are most commonly located in the thoracic region (because there are more thoracic segments), followed by the cervical cord, and rarely present as an isolated or focal lesion in the conus.14,16,17 In children, involvement of the entire cord is common; however, this is rare in adults.14,16 Unlike cerebral gliomas, contrast enhancement almost always occurs in spinal astrocytomas, and is poorly correlated with tumor grade. The higher grades may have leptomeningeal spread. Clinical presentation depends upon the lesion location, and may include gait abnormalities, pain and loss of previously attained motor skills.18 Symptoms tend to occur earlier in children than in adults.18 Astrocytomas tend to be more infiltrative than ependymomas, increasing the morbidity resulting from, and decreasing the success of, surgical resection. However, grade I astrocytomas in children tend to behave like intracranial pilocytic astrocytomas, and displace the cord rather than infiltrate it. Because surgery almost invariably leaves some neoplasm behind, adjunctive radiation therapy is often required to manage these infiltrative lesions. The clinical presentation is nonspecific and includes pain and sensory and motor deficits. Up to one third of patients will have von Hippel Lindau syndrome (VHL). VHL commonly presents with multiple hemangioblastomas, usually these are infratentorial affecting the cerebellum, brainstem, spinal cord and eye. The retinal or cerebellar lesions are usually symptomatic before the spinal-cord mass21,24 Surgical resection of the lesion is the treatment of choice for solitary hemangioblastomas. Additionally, preoperative embolization of these highly vascular lesions has been utilized to reduce intraoperative bleeding. In one autopsy series of patients with known multiple sclerosis, Ikuta et al. found spinal cord involvement in 86% of patients, with 13% having only spinal cord lesions. 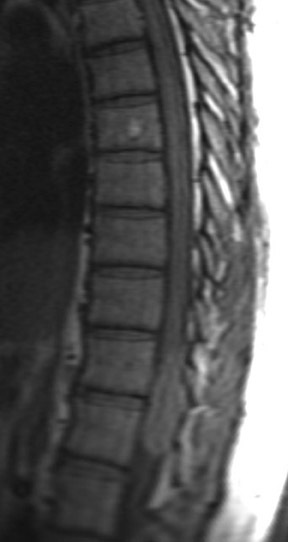 The majority of MS lesions are identified in the cervical cord.27 Lesions are typically located peripherally within the cord (that is where the white matter lies), involve less than half of the spinal cord’s cross-sectional area, and typically are <2 vertebral body’s in vertical length.28 Medical therapy is the treatment of choice for MS management. 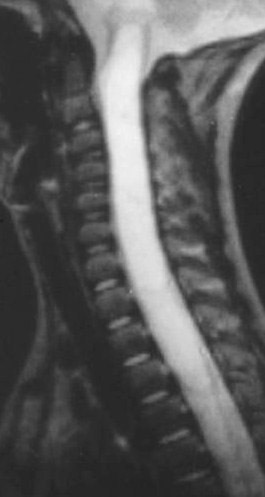 Hydromyelia, like hydrocephalus, is an accumulation of cerebrospinal fluid (CSF) within an ependymal-lined space, leading to distension of the central canal of the spinal cord. 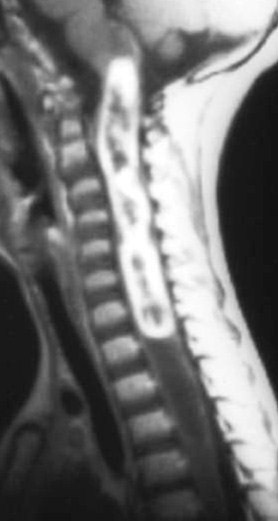 In contrast, CSF dissecting into the adjacent white matter, to form a paracentral cavity, is called syringomyelia. The distinction between these is based on identifying the ependymal lining of a hydromyelia. Unfortunately, the ependyma may be destroyed by significant dilatation of the central canal. Because these 2 entities may be hard to distinguish pathologically; and, because they may often coexist, fluid spaces within the cord are often described as syringohydromyelia. Males and females are equally affected, and lesions are more often found in adults than children. Although the clinical presentation varies widely, a common presentation includes loss of pain and temperature sensation with preservation of proprioception (position sense). Given the multiple etiologies of syringohydromyelia, its treatment is multifactorial and involves multiple surgical options. Syringohydromyelic cavities often cause cord expansion. Pojunas et al. described the imaging characteristics of syringes as following CSF signal; low signal on T1W images and high signal on T2W images (Figure 7).33 The lesion does not enhance after the administration of contrast material; and, enhancement indicates a coexisting lesion, such as a glioma or hemangioblastoma. Meningioma represents 25% of all intraspinal tumors34 and they are most commonly found in the intradural-extramedullary compartment, but rarely may be epidural in location.35 The majority of spinal meningiomas are WHO grade I. Most common in women >40 years, these tumors are usually found in the thoracic spine, followed by the cervical and lumbar spine. This distribution probably reflects the greater length of the thoracic spinal cord more than anything else. Clinical presentation is nonspecific and may include sensory and motor symptoms, as well as bladder dysfunction. These lesions are managed surgically. On computed tomography (CT), meningiomas are frequently hyperdense, reflecting their highly cellular nature, and associated calcification. Takemoto et al. described the typical imaging findings of meningioma to be isointense to the spinal cord on T1W images, isointense to the cord on T2W images (Figure 8), and intensely enhancing after contrast administration.36 As in the skull, intraspinal meningiomas may have a broad base of dural attachment, making them convex toward the cord and flat on the opposite side toward the dura. 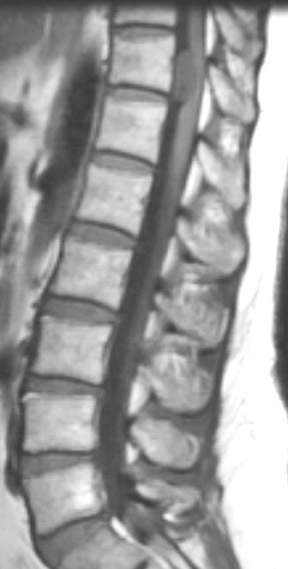 They may result in hyperostosis of adjacent bone, but this is less common than in intracranial meningiomas, which may be due to the presence of the venous plexus and a greater amount of fat in the epidural space of the spine. Meningiomas typically do not demonstrate extension through the neural foramen in the spine, which can help distinguish them from nerve sheath tumors. Schwannomas are the most common intradural extramedullary spinal tumor, representing 43% to 67% of tumors in this category.37–40 Peak onset age ranges from 30 to 50 years of age, without a gender predilection. They are typically solitary, but multiple schwannomas can be seen in inherited tumor syndromes such as neurofibromatosis type 2 and Carney complex. 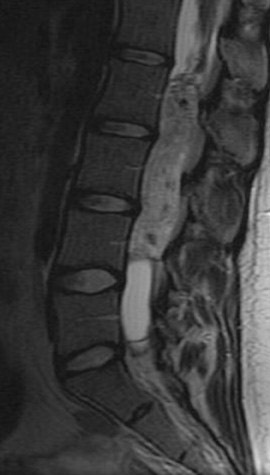 Schwannomas are most often detected in the lumbar spine. While most are incidental findings, clinical symptoms can include weakness and bladder dysfunction. Schwannomas are encapsulated and peripherally located along the affected nerve; making surgical resection less complicated than in neurofibroma, which infiltrates the nerve fasicles. 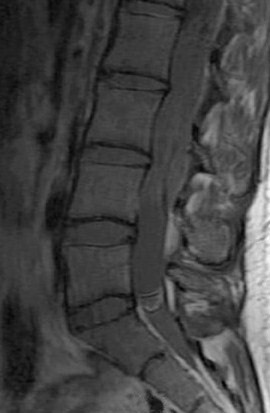 Schwannomas are primarily isointense to the spinal cord on T1W images, hyperintense to the cord on T2W images, and show intense enhancement after contrast administration (Figure 9).36 The imaging pattern will vary with the degree of cystic degeneration, presence of hemorrhage or fatty degeneration. Neurofibromas account for 23% of all spinal tumors.41 They can be solitary, or multiple lesions may be seen in patients with neurofibromatosis type 1. The peak age of onset is the third to fourth decades. They may be plexiform, and can occasionally undergo malignant degeneration. Hemorrhage and fatty degeneration are uncommon. Surgical resection is the treatment of choice for neurofibromas and is complicated by the infiltration of the lesion among the nerve fasicles, requiring resection of the parent nerve with the tumor. Clinical presentation includes lower lumbar pain, sensory or motor loss to the lower extremities, and bowel and bladder dysfunction.45 Given the tumor’s vascularity, these lesions sometimes require preoperative embolization prior to surgical resection. Intradural spinal lesions have a wide range of etiologies, and it is important to distinguish between etiologies due to the range of treatments and prognoses between the separate entities. MRI findings, the patient’s demographic information and clinical history are the best tools the radiologist can use to delineate one cause from another. The first step in identifying any intradural lesion is distinguishing it by its location: either intramedullary (within the cord substance) or extramedullary (outside the cord but within the thecal sac). Ependymomas are the most common intramedullary lesions in adults, while astrocytomas are the most common intramedullary lesions in children. Other factors used to distinguish these 2 common lesions are position within the cord (central for ependymomas, eccentric for astrocytomas). It is important to note that ≤38% of ependymomas may be eccentric in location. A hemosiderin cap can be seen in up to one third of ependymomas—a finding not seen in astrocytomas. Prognosis is better for ependymomas, given their tendency not to infiltrate, allowing for easier surgical resection vs. the infiltrating nature of astrocytomas. Increased vascularity within an intramedullary lesion with T2W flow voids is a distinguishing characteristic of hemangioblastomas, which can be associated with von Hippel Lindau syndrome. 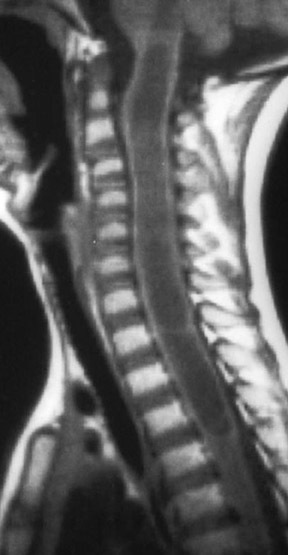 Syringohydromyelia follows the CSF signal without enhancement, unless an adjacent lesion is present. Additionally, multiple sclerosis can cause a cord-expanding intramedullary lesion that enhances in an active lesion, which tends to be eccentric within the cord corresponding to the lateral position of the white matter within the spinal cord. Multiple sclerosis does not respect the boundary between white and gray matter. When evaluating extramedullary spinal lesions, many factors can be used to delineate between common lesions. Meningiomas are most commonly found in middle-aged women, and like their intracranial counterparts, often have a broad base of dural attachment. Schwannomas have no gender predilection, but are associated with neurofibromatosis type 2, and should be strongly considered in an extramedullary lesion in this population. Neurofibromas are associated with neurofibromatosis type 1, and may demonstrate a target-sign pattern on T2W images, which is suggestive, but not pathognomonic for neurofibroma. Additionally, an extramedullary paraganglioma will sometimes show the salt-and-pepper appearance seen in its head-and-neck counterparts, aiding in its diagnosis. Ferrante L, Mastronardi L, Celli P, et al. 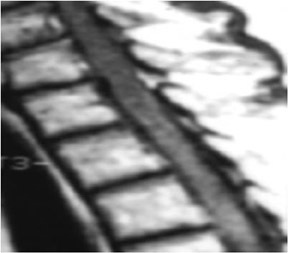 Intra-medullary spinal cord ependymomas: A study of 45 cases with long-term follow-up. Acta Neurochir. 1992;119:74-79. Epstein FJ, Farmer JP, Freed D. Adult intramedullary spinal cord ependymomas: The result of surgery in 38 patients. J Neurosurgery. 1993;79:204-209. Hoshimaru M, Koyama T, Hashimoto N, Kikuchi H. Results of microsurgical treatment for intramedullary spinal cord ependymomas: Analysis of 36 cases. Neurosurgery. 1999;44:264-269. Fine MJ, Kricheff II, Freed D, Epstein FJ. 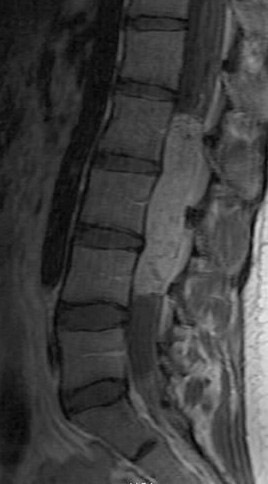 Spinal cord ependymomas: MR imaging features. Radiology. 1995;197:655-658. 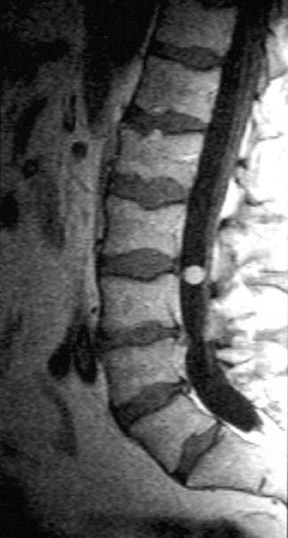 Koeller K, Rosenblum R, Morrison A. Neoplasms of the spinal cord and filum terminale: Radiologic-pathologic correlation. Radiographics. 2000;20:1721-1749. Kahan H, Sklar EM, Post MJ, Bruce JH. MR characteristics of histopathologic subtypes of spinal ependymoma. AJNR Am J Neuroradiol. 1996;17:143-150. Zimmerman RA, Bilaniuk LT. 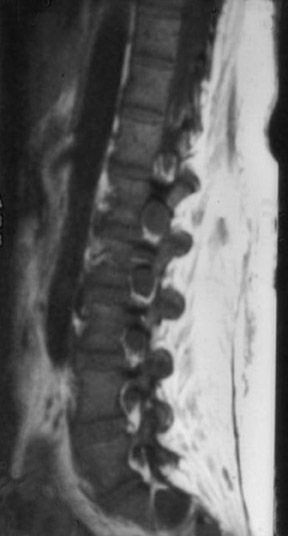 Imaging of tumors of the spinal canal and cord. Radiol Clin North Am. 1988;26:965-1007. Slasky BS, Bydder GM, Niendorf HP, Young IR. MR imaging with gadolinium-DTPA in the differentiation of tumor, syrinx, and cyst of the spinal cord. J Comput Assist Tomogr. 1987; 11:845-850. Goy A, Pinto R, Raghavendra B, et al. 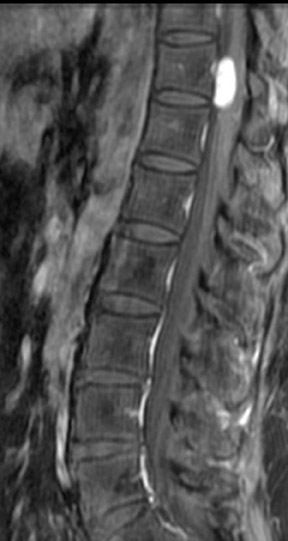 Intramedullary spinal cord tumors: MR imaging with emphasis on associated cysts. Radiology. 1986;161:381-386. Parizel P, Baleriaux D, Rodesch G, et al. Gd-DTPA enhanced MR imaging of spinal tumors. AJR Am J Roentgenol. 1989;152:1087-1096. Rothwell CI, Jaspan T, Worthington BS, Holland IM. Gadolinium-enhanced magnetic resonance imaging of spinal tumours. Br J Radiol. 1989;62:1067-1074. Wagle W, Jaufman B, Mincy JE. Intradural extramedullary ependymoma: MR pathologic correlation. J Comput Assist Tomogr. 1988;12 (suppl 4):705-707. Wippold FJ, Smirniotopoulos JG, Moran CJ, et al. MR imaging of myxopapillary ependymomas: Findings and value to determine extent of tumor and its relation to intraspinal structures. AJR Am J Roentgenol. 1995;165:1263-1267. Brotchi J, Fischer G. Treatment. In: Fischer G, Brotchi J, Eds. Intramedullary spinal cord tumors. Stuttgart, Germany: Thieme; 1996;60-84. Bruner JM. Neuropathology of malignant gliomas. Semin Oncol. 1994:21:126-138. Epstein FJ, Farmer JP, Freed D. Adult intra-medullary astrocytomas of the spinal cord. J Neurosurg. 1992;77:355-359. Epstein F, Epstein N. Surgical treatment of spinal cord astrocytomas of childhood. A series of 19 patients. J Neurosurg. 1982;57:685-689. Constantini S, Houten J, Miller D, et al. Intramedullary spinal cord tumors in children under the age of 3 years. J Neurosurg. 1996;85: 1036-1043. Patel U, Pinto RS, Miller DC, et al. MR of spinal cord ganglioglioma.AJNR Am J of Neuroradiol. 1998;19:879-887. Murota T, Symon L. Surgical management of hemangioblastoma of the spinal cord: A report of 18 cases. Neurosurgery. 1989;25:699-708. Xu QW, Bao WM, Mao RL, Yang GY. Magnetic resonance imaging and microsurgical treatment of intramedullary hemangioblastomas of the spinal cord. Neurosurgery. 1994;35:671-676. Browne TR, Adams RD, Robertson GH. 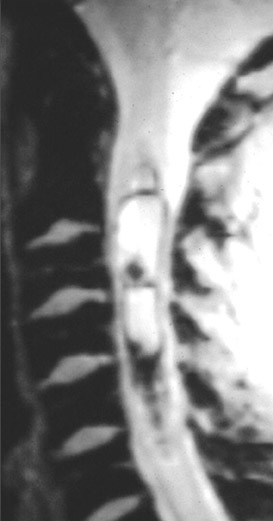 Hemangioblastoma of the spinal cord. Review and report of five cases. Arch Neurol. 1976;33: 435-441. Neumann HPH, Eggert HR, Weigel K, et al. Hemangioblastomas of the central nervous system: A 10 year study with special reference to von Hippel Lindau syndrome. J Neurosurg. 1989; 70:24-30. Chu BC, Terae S, Hida K, et al. MR findings in spinal hemangioblastoma: Correlation with symptoms and with angiographic and surgical findings. AJNR Am J Neuroradiol. 2001;22:206-217. Osborn Ag, Harnsberger HR, Smoker WRK, Boyer RS. Multiple sclerosis in adolescents: CT and MR findings. AJNR AM J Neuroradiol. 1990;11:489-494. Ikuta F, Zimmerman HM. Distribution of plaques in seventy autopsy cases of multiple sclerosis in the United States. Neurology. 1976; 8:26-28. Tartaglino L, Friedman D, Flanders A, et al. Multiple sclerosis in the spinal cord: MR appearance and correlation with clinical parameters. Radiology. 1995;195:725-732. Trop I, Bourgouin P, Lapierre Y, et al. 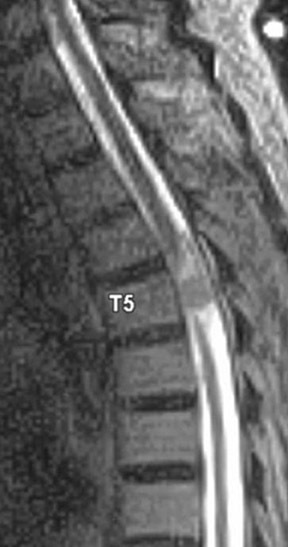 Multiple sclerosis of the spinal cord: Diagnosis and follow-up with contrast-enhanced MR and correlation with clinical activity. AJNR Am J Neuroradiol. 1998; 19:1025-1033. Barnett HJM, Foster JB, Hudgson D. Syringomyelia. London: WB Saunders Co; 1973. Milhorat TH, Miller JI, Johnson, WD, et al. Anatomical basis of syringomyelia occuring with hindbrain lesions. Neurosurgery. 1993;32: 748-754. Elster AD, Chen MYA. Chiari I malformation: Clinical and radiologic reappraisal. Radiology. 1992;183:347-353. Pojunas K, Williams AL, Daniels DL, Haughton VM. Syringohydromyelia and hydromyelia: Magnetic resonance evaluation. Radiology. 1984;153: 679-683. Solero CL, Fornari M, Giombini M, et al. Spinal meningiomas: Review of 174 operated cases. Neurosurgery. 1989;25:153-160. Khamary SM, Alorainy IA. Case 100: Spinal epidural meningioma. Radiology. 2006;241:614-617. Takemoto K, Matsumura Y, Hashimoto H, et al. MR imaging of intraspinal tumors—Capability in histological differentiation and compartmentalization of extramedullarytumors. Neuroradiology. 1988;30:303-309. Hufana V,Tan JSH, Tan KK. Microsurgical treatment for spinal tumors. Singapore Med J. 2005;46:74-77. Prevedello DM, Koerbel A, Tatsui CE, et al. Prognostic factors in the treatment of the intradural extramedullary tumors: Astudy of 44 cases. Arq Neuropsiquiatr. 2003;61:241-247. El-Mahdy W, Kane PJ, Powell MP, Crockard HA. Spinal intradural tumors: Part I—Extramedullary. Br J Neurosurg. 1999;13:550-557. Garrido P, Laher-Mooncey S, Murphree NL, et al. Neoplasms involving the spinal cord in Zimbabweans: An analysis of 262 cases. Cent Afr J Med. 1994;40:201-204. Levy WJ, Latchaw J, Hahn JF, et al. Spinal neurofibromatosis: A case report of 66 cases and a comparison with meningiomas. Neurosurgery. 1986;18:331-334. Murphey MD, Smith SW, Smith SE, et al. Imaging of musculoskeletal neurogenic tumors: Radiologic-pathologic correlation. Radiographics. 1999;19:1253-1280. Binkley W, Vakili ST, Worth R. Paraganglioma of cauda equina. Case report. J Neurosurg. 1982; 56:275-279. Moran CA, Rush W, Mena H. Primary spinal paragangliomas: A clinicopathological and immunohistochemical study of 30 cases. Histopathology. 1997;31:167-173. Sonneland PRL, Scheithauer BW, Lechago J, et al. Paraganglioma of the cauda equina region: Clinico-pathologic study of 31 cases with special reference to immunocytology and ultrastructure. Cancer. 1986;15:1720-1735. Hayes E, Lippa C, Davidson R. Paragangliomas of the cauda equina. AJNR Am J Neuroradiol. 1989;10:S45-S47. Pigott TJD, Lowe JS, Morrell K, Kerslake RW. 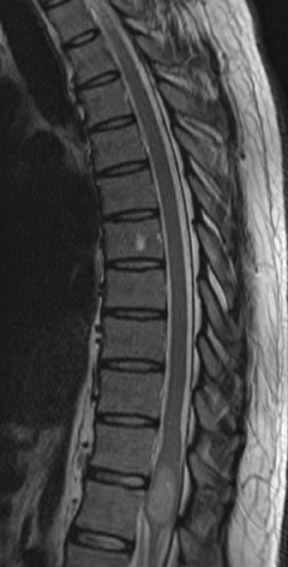 Paraganglioma of the cauda equina: Report of three cases. J Neurosurg. 1990;72:455-458. Iliya AR, Davis RP, Seidman RJ. 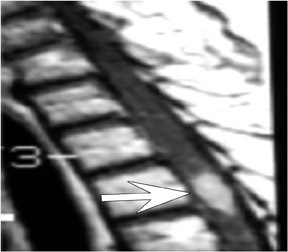 Paraganglioma of the cauda equina: Case report with magnetic resonance description. Surg Neurol. 1991;35:366-367. Wester DJ, Falcone S, Green BA, et al. 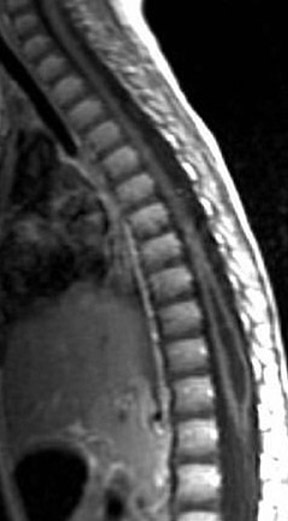 Paraganglioma of the filum: MR appearance. J Comput Assist Tomogr. 1993;17:967-969. Aggarwal S, Deck JH, Kucharczyk W. Neuroendocrine tumor (paraganglioma) of the cauda equina: MR and pathological findings. AJNR Am J Neuroradiol. 1993;14:1003-1007. Boukobza M, Foncin JF, Dowling-Carter D. Paraganglioma of the cauda equina: Magnetic resonance imaging. Neuroradiology. 1993;35(6): 459-460. Intradural spinal lesions. Appl Radiol.